In the spring of 2002, the Chamber of Commerce in Elk Grove, CA, bought 50 life-size fiberglass elk statues, to put up all over town. 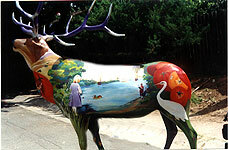 I saw one truckload of 10 or 12 unpainted fiberglass elks enter town sometime in June, 2002. A few weeks later, I saw two dozen or more of them in front of a warehouse near Highway 99, awaiting painting and display. Gradually, local stores began sponsoring individual elk statues, and commissioning local artists to paint them creatively. Each elk was given its own unique name, a cement platform to mount the elk statue, and a plaque with the statue's name, the corporate sponsor's name, and the artist's name. ELKamino, in front of Border's Books at 7415 Laguna Boulevard, is the first elk I found. It is also the first elk you'll find as you travel down Laguna Boulevard, from Laguna's starting point at Interstate 5. 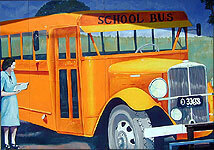 You will find it in the Target shopping center, which is on your left, just past Bruceville Road. Commissioned by Donahue Scribner Realty Group and created by artist Helen Plenert-Horiuchi, ELKamino is decorated like a Chevrolet El Camino, complete with chrome trim and lights, and even a rear license plate! Note the fuzzy dice and hula dancer in his antlers. I had great fun with these. When I heard the Fine Arts Center of Sacramento was doing a benefit auction for the refurbishing of the local public swimming pool I was interested in helping. This is the same pool that I had used when I was a child. Now neighbors were getting together to help renovate it for another generation. 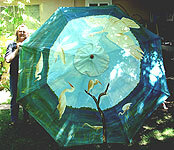 I just needed to come up with a idea for the umbrella that fit my style of painting.